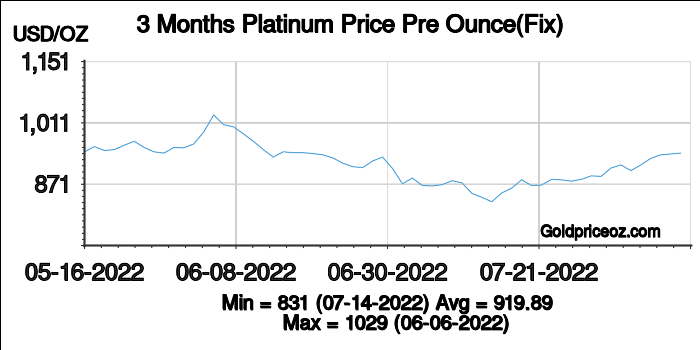 Platinum price in United States in U.S. Dollar(USD) per ounce is a free service provided by Platinum Price OZ website, where shows current platinum price(including bid price and ask price) and platinum price history chart(London platinum fixing price). Platinum price in United States per ounce today is being updated once every 1 minutes. The U.S. is the third largest gold producer, after China and Australia. There are lots of mines in Nevada produced more than 80% U.S. gold. Whereas other famous U.S. gold mines are located in Colorado and Alaska. Its official gold holdings are 8,133.5 tons which is the largest official gold holdings in global. American gold market was developed in the middle of 1970s, mainly the COMEX division of New York Mercantile Exchange, and later was incorporated into the CME. 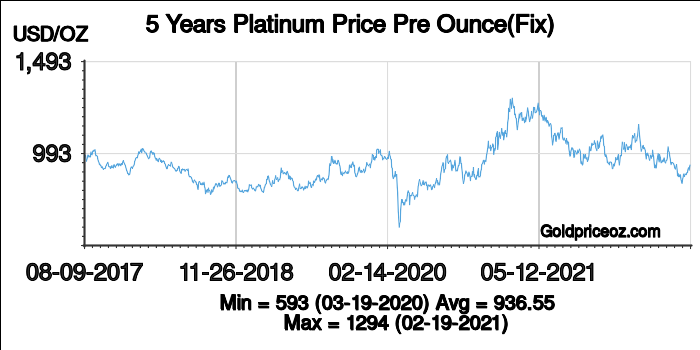 American gold market mainly trades gold futures, currently it becomes the world's largest trading volume and most active gold futures market, it also is the most efficient and complex futures trading organization. 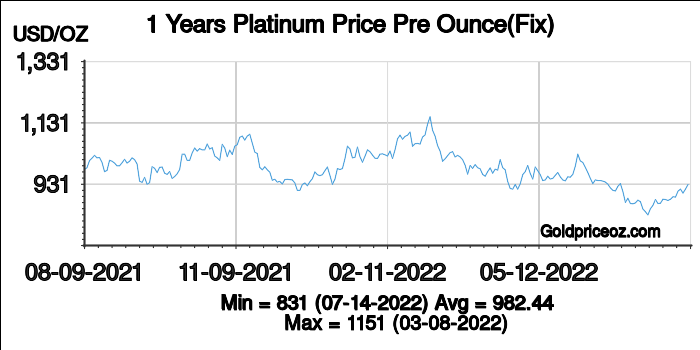 Its major trading objects are gold, platinum, copper, and some financial derivatives. The transactions of gold futures and gold options are on the top of the world, are also recognized as the trading center of precious metals. At present, the varieties transactions contain gold futures, Mini options, options and funds. The New York Mercantile Exchange (NYMEX) is a commodity futures exchange owned and conducted by CME Group of Chicago. Its headquarters is in New York, American. In 1975, the New York Commodity Exchange (COMEX) was starting forward trading of gold, and became the center of the forward trading of gold in the world. In 2006, NYMEX joined hands with the Chicago Mercantile Exchange to use Globex. In August 2008, it was acquired by CME Group of Chicago, became a subsidiary of the CME Group. CME Group Inc. (Chicago Mercantile Exchange) is the world's largest futures exchange firm which headquarters is in Chicago, U.S. It owns and operates large derivatives and futures exchanges in New York and Chicago City, along with online trading platform. It also owns the Dow Jones stock and financial indexes, and CME Clearing Services that offers settlement and clearing of exchange trades. The exchange-traded derivative contracts include equity indexes, foreign exchange, futures and options based on interest rates, energy, agricultural commodities, weather, rare and precious metals, and real estate. The CME Group was established in 2007 by the merger of the Chicago Board of Trade (CBOT) and the Chicago Mercantile Exchange (CME). In 2008, it acquired the New York Mercantile Exchange (NYMEX). In February 2010, CME announced it purchased 90% of Dow Jones Indexes, including the Dow Jones Industrial Average. The American Gold Eagle is an official gold coin in the U.S. In 1986, the Gold Eagle was first issued by the United States Mint. The weights of American Gold Eagle are in 1/10 oz, 1/4 oz, 1/2 oz, or 1 oz denominations. Its fineness is 22 Karat, contains 91.67% gold (22 karat), 3% platinum, and 5.33% copper. Generally, its market value is equal to the market of its gold content, not its face value.